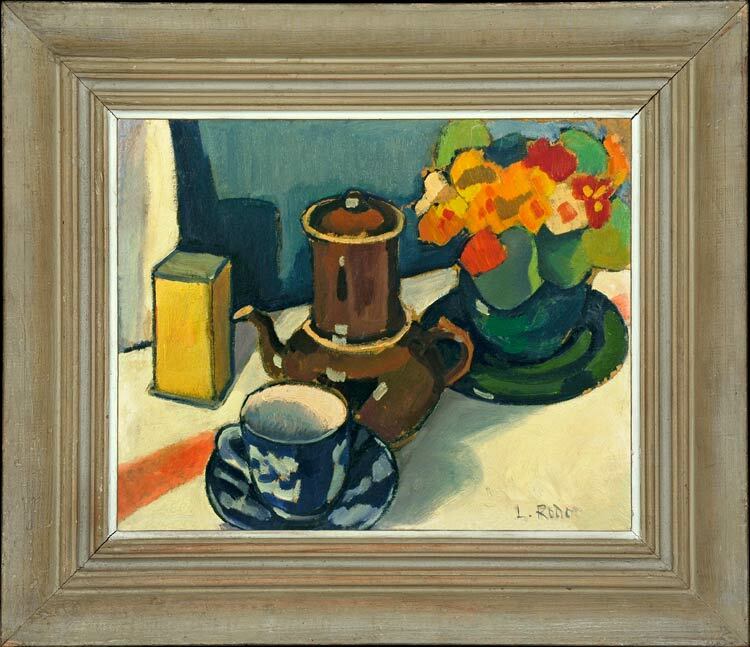 This work is characteristic of Rodo’s still life paintings in its close focus and viewpoint sited slightly above the subject, as well as in the three-dimensional realism of the various items. It is related in these aspects, and also in its colouring, to work by the Bloomsbury artists (Roger Fry, Vanessa Bell and Duncan Grant); although Rodo’s style is perhaps more earthy and reliant on passages of a succulent black influenced by Manet. The vase of orange and scarlet flowers shows the trace of his Fauvist period, and the relationship of the different objects in space and to one another reveals that he had also studied the work of Cézanne. Colourful and strongly painted, this is a picture which shows little trace of his father’s influence (Camille Pissarro). Ludovic Rodo [Ludovic-Rodolphe Pissarro] (1878-1952) was the fourth son of the Impressionist Camille Pissarro; there are several portraits of him by his father (nearly all reading). He was encouraged by Pissarro to experiment in various media (oils, tempera, watercolour, engraving and lithography), publishing his first wood engraving at the age of 16. In the 1890s he moved with Pissarro to Belgium, where he met the Post-Impressionists van Rysselberghe, Luce and van de Velde; he also visited London, where his brother Lucien was working. Like Toulouse-Lautrec, he found many of his subjects in the night-life of Paris, or – like his father – in the streets of London. He exhibited with the Fauves in the Salon des Indépendents of 1905 and founded the Monarro Group with Lucien in 1915. In 1939 he published the two volume catalogue raisonné of his father’s work which remained the definitive work until the 2006 version by Pissarro’s great-grandson, Joachim. Works in public collections include Danseuses roses, c.1911 (Oxford, Ashmolean Museum).